In my previous posting on the issue of GPS track log accuracy, I made a case that the 500-600 points produced by recording every 6 meters (20 feet) or so should be plenty to give an accurate picture of the average 4 mile hike and that the additional 9000 or so points proffered by Garmin’s preferred (to put it mildly!) “1-second distance accumulation” method should not, assuming that the points are accurate, change the track length by any significant amount. But we have the simple fact that my friends and I have gotten a substantial discrepancy on every single mountain hike we’ve taken with my new Garmin 62stc device, errors ranging from 10-40% – which I would call significant! So which one is right? Or, I should say, which is more accurate? Because nothing is perfect, after all. This is all about the accuracy. I want to make it clear that I am not meaning to “dis” the accuracy of the GPS unit itself. The reason I didn’t take the thing back to REI after its first hike was that I could tell that it was handling the challenging conditions of hiking in the North Cascades quite well. It acquires a signal very quickly and holds it even under deep forest cover. It does a good job of tracking the switchbacks, reacting to a sudden direction change much faster than my other models. Each individual reading from the device is quite good, given the conditions. Just how big are these errors? Will they tend to cancel out? Or will they tend to accumulate? Looking at the last point first: if the errors were even as small as 3-4 inches, 9000 of them would accumulate to about a half mile! So this is not a trivial question. Error analysis is difficult, by its very nature, especially when you have no independent means of verification. Nice straight lines just don’t exist in the forests on the sides of mountains. The trails tend to be hidden under the trees and thus not visible on aerial or satellite photos, and I don’t have a ball of twine long enough to stretch along the trail. So there will have to be a lot of guesswork and some hand-waving, but I will try to make the estimates very conservative and give the benefit of every doubt. It is very, very conservative to say that you might expect any recorded point along the track to be off by a foot or so from the true path. Because of the steepness and roughness of the trails, we are often traveling at only 1 or 2 feet per second; we hardly ever average better than 3 fps (2 mph). Let me compare this to the situation you have when riding in a vehicle at, say, 20 mph (or 30 fps). In one second you travel about 30 feet and record a point that is off by, say 1 foot. Sometimes the error in that point may be in the direction of travel, so the estimated distance might be as little as 29 feet or as much as 31 feet; but that sort of error will tend to cancel itself out – if this reading is a foot short, the next will likely be a foot long. This is not a problem since we are just interested in the total. The sort of error that will NOT cancel is when the estimated point is off the true path to one side or the other. If this point is a foot off to the left, then the next might be off to the right, compounding the error rather than canceling. If the next point is off to the left also, then it might not add to the error, but there is no reason to expect that it would cancel it out. And when you go off the track you don’t have to go off to the other side on the next reading, but you do have to get back to the true path eventually if the track is to be worth anything. What sort of error are we talking about here? The worst case would be where the estimated point is a foot to one side of the true path – I’m picturing a a right triangle with a 30 foot leg (the true distance) and a 1 foot leg (the error). The GPS will be measuring the straight line distance from the starting point to the estimated point, i.e., the hypotenuse of that triangle. Mr. Euclid assures us that the length of that hypotenuse is the square root of the sum of the squares of 30 and 1, that is, the square root of 901 or 30.0166. So the error is that 0.0166 foot or about 0.2 inch. Which ain’t much. In terms of percentages an error of 0.2 inch in a measurement of 30 feet works out to about 0.057%. This is a very tiny error that explains why Garmin’s strategy works quite well when you use the device in a car, or even a bike. But this all depends strongly on the fact that the thing being measured is thirty times larger than the error, more than an order of magnitude. If that ratio came down to 10 (one order of magnitude) the percentage error would still be small – about 0.5% – not enough to bother with. This is enough to bother a hiker – if you were training for a trip down into the Grand Canyon by making “10 mile” hikes that were in fact only 6 miles long, you could get a nasty surprise when you get to Arizona! I know that this does not prove anything. The thing I hope you take away is this: the small errors that are unavoidable in each point of a track will tend to accumulate, which means that sometimes less is better. And given our slow rate of travel and difficult sky conditions, it would be very reasonable to expect the “1-second distance accumulation” method to generate errors on the scale that I’ve observed on the trail. If a user believes that the “1 second distance accumulation” is a good idea and gives her good results, then she can choose that option in the track log setup. But if she has a valid reason NOT to sample that many points and wants to make a track with the points spaced further out FOR WHATEVER REASON (but her reason, not yours), then there is currently no way for her to measure the length of that track in the field. You may not like her reason, you may snicker behind your hand that she would want to do something you think is foolish, but it is (pardon the expression) none of your freakin’ business! When the user uses anything but the one second track interval the track log is “missing” data. We are putting a value for total distance in the GPX file in the track stats tag that gives BaseCamp the 1 second distance accumulation ( even if they are not setup for 1 second distance accumulation ). So when the user removes the first point BaseCamp can no longer use our 1 second distance accumulation value and has to fall back on the old method of summing the delta between all of the points. The problem is that all of the points are not there, because they are setup to record at a less than 1 second interval. So when this happens they think they are just removing 1 point, while in reality they are removing possibly thousands of points along the entire track which is why the distance changes. The substance is that they have finally acknowledged what I have been saying for the last six months and what I suggested in the last paragraph of my first posting on this issue back on June 10, 2014. That’s the good news; the bad news is that they clearly seem to think that substituting in the “1 second distance accumulation” is a good idea! If it took six months to get them to even admit what they are doing, how long will it take to make them see that what they are doing is just plain wrong? 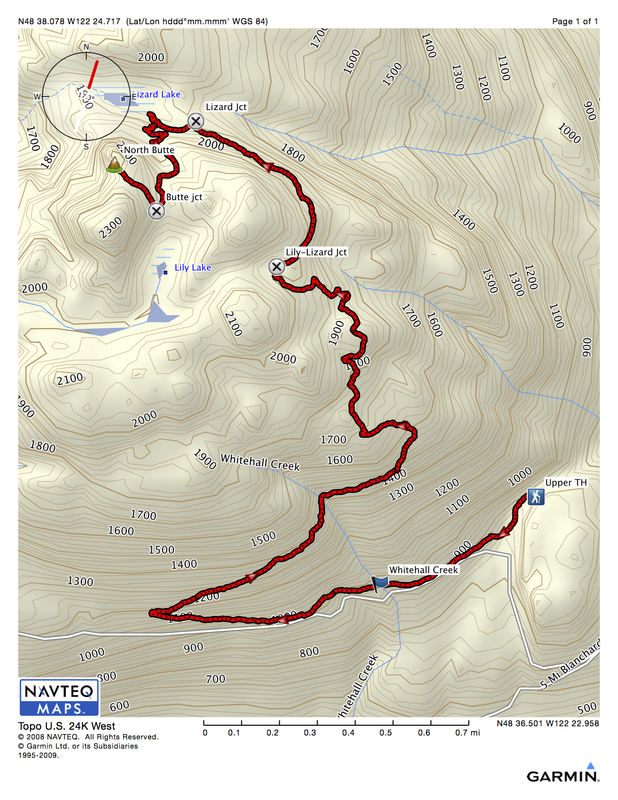 The Lily and Lizard Lake Trail, Skagit County, WA – 687 points provide a lot of detail. After a lot of experimentation, I have my Garmin GPSmap 62stc set up to record a track log point roughly every 20 feet (6 meters). Since we usually average only one or two feet per second when hiking uphill, Garmin’s “1 second distance accumulation” would mean recording a point every foot or so – ten or twenty times as much data. For example, on the first half of last Thursday’s hike I recorded 687 points in roughly 4 miles, at an average distance of about 30 feet, as shown in the picture; the elapsed time was about 2:37 so the 1 second method would have totaled up around 9,400 intervals of about 2 feet each. The total track length (by the 1 second method) was listed as 4.7 miles. When I deleted a single point and forced a recalculation (“losing” almost 9000 points) the length changed to 4.2 miles. Why my points were 30 feet apart rather than the 20 I asked for is something only Garmin could answer, but it is not a big deal: 687 points is more than enough to make a very good picture of the trail we were on. The track agrees very closely both with my previous tracks (made with different Garmin devices) and with published information and maps of this very popular local trail. We had good weather, we were moving at a good, steady rate with few stops and the device showed an accuracy between 10 and 20 feet (about as good as it gets) every time I checked (which was often). Even on these winding mountain trails it’s not like we are juking rapidly from side to side as we go along – with the exception of the occasional 179° switchback, you are usually traveling more or less in a straight line. I’ve been paying attention to that this summer – most of the time you can see straight ahead along the trail for 20 or 50 or even 100 feet, then there is a subtle change of direction and you go straight for another stretch. A lot of the trails, including large parts of this one, follow old logging roads and railroads (which are not prone to rapid direction changes) and have only a handful of sharp turns. I think if you joined us on a hike you would agree that if you could accurately record a point every 20 or 30 feet or so you would get a pretty darn good track, and it should contribute almost nothing (except for a whole lot of extra data) to the measured length of the trail to accurately record a few thousand intermediate points along the way. And I agree completely! Where we differ is that Garmin seems to think that more is necessarily better, that those thousands of additional points must be an improvement. That is a common fallacy – more chocolate is better; more habanero pepper maybe not so much. I think I made a pretty good argument that those thousands of extra points cannot increase the accuracy by more than few feet in a mere handful of sharp turns, nothing like a half a mile. My argument is that the 1 second method was adding in an additional 9000 tiny errors – that would be a positional error averaging only 3.5 inches per reading, and that on a device that is only claiming accuracy of 10-20 feet. So my assignment (which I very much do choose to accept!) is to try convince a bunch of engineers who work and probably live in a place with very few hills, very few clouds and very few trees that there are situations where a lot of their precious data is more like pepper than chocolate and is ruining the result rather than flavoring it. And more poignantly, that this particular kind of pepper never improves the dish – most of the time is does no harm but it can never help. I intended to dig into the gritty geometric and arithmetic details that support this argument but this is more than enough for one day.